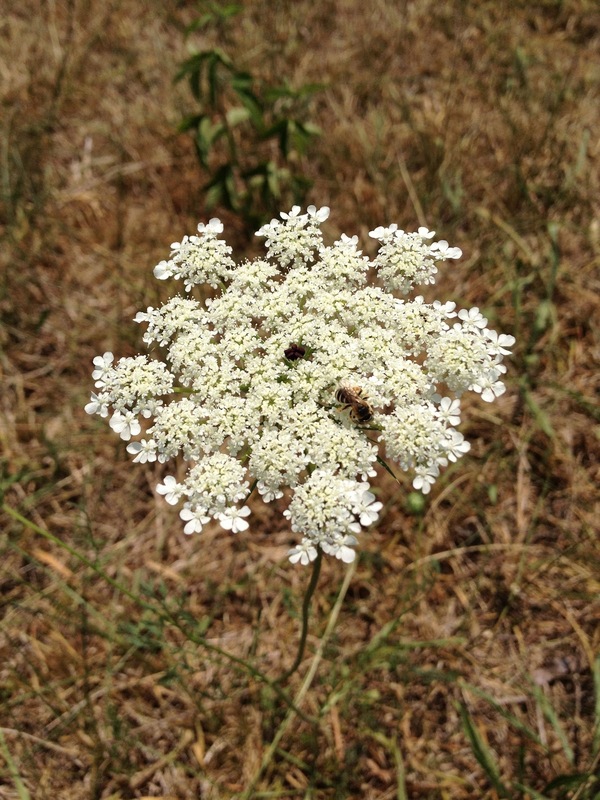 Queen Anne's Lace in a parched field. Last week, I attended a wonderful lecture by biologist, David Haskell (The Forest Unseen: A Year's Watch in Nature), who urged us to study the life in our own backyard and in so doing gain a deeper awareness and appreciation for the natural world around us. Now, I feel a bit cramped to study life in the small area he observed for a year – a square meter plot (10.8 square feet)! I’m more of an “along-the-highway” observer, and the wildflowers growing on roadsides fascinate me. During this June weather when those of us on the Cumberland Plateau suffer from the effects of a horrific heat wave and are forced to stay indoors too much, I make a few forays outdoors to tend my domestic plants, which gasp for water. I see leaf wilt daily and flowers struggling to survive, despite the fact that I give the plants a drink twice a day. I had finally discovered deer and rabbit proof plants when the unusual heat wave struck and began to destroy my small garden. So I’m inclined to confine my nature studies to jaunts in an air-conditioned car, viewing plant life in fields and along the road while traveling from Sewanee to Monteagle or from Sewanee to Cowan and Winchester, Tennessee. The sight that lifts the heat for me is that of Queen Anne’s Lace (otherwise known as wild carrot) growing in white patches along roadsides. The umbrella-like inflorescence resembling lace reminds me of delicate snowflakes and a cooler time. The leaves look like those of carrots and are said to also resemble some poisonous kin – fool’s parsley and poison hemlock. Once I admire a plant, I look for information about any practical or medicinal properties it has, and I found that the root of Queen Anne’s Lace can be made into teas, which are used as diuretics and as solutions to get rid of bodily parasites. For overindulgent tipplers, the tea can also be used to treat hangovers, and wild edible chefs use the roots of the plant to flavor soups. Naturally, the plant bears a queen’s name. The legend ascribed to its name is that Queen Anne, queen of England, Scotland, and Ireland during the 18th century, was fond of doing lace handwork and challenged her ladies-in-waiting to a lace-making contest. However, while working with the lace, she pricked her finger, causing a drop of blood to fall into the snowy lace – thus, the purple floret in the center of the Queen Anne flower inspired the name. An English botanist, Geoffrey Grigson, refuted the legend and related that the name really derives from Saint Anne, mother of the Virgin Mary and patron saint of lace makers. Another story about the flower’s name is more credible – the white clusters simply reminded the British people of the Queen’s headdress. By the way, the root of the flower is esculent – a new word for me that means edible. However, I prefer looking at the fields of white lace, rather than picking the plants to make soup! This bold June sun melts. Years ago, I wrote Their Adventurous Will: Profiles of Memorable Louisiana Women, a book that highlighted the contributions women have made to the culture and society of Louisiana, and a friend told me that I should do a companion piece about memorable Louisiana men. I haven’t followed up on that idea, but in the ensuing years since the remark was made, I've showcased some memorable men in my blogs. Last week, I learned that Johnnie Daniel, my second cousin, who lives in Franklinton, Louisiana, was named “West Washington Parish Citizen of the Year,” and I think that he’s a man who deserves kudos for achieving this honor. Twenty-nine years ago, Johnnie, an outstanding athlete who excelled in his favorite sport, baseball, slid into first base head first and broke two vertebrae, an accident that left him paralyzed from the chest down. At a rehab center in Jackson, Mississippi, Johnnie was told that his parents, Sara and John L., would never be able to take him home and do the things that were needed for his health and stability. However, his parents wouldn’t accept that verdict. Despite their own health reverses at times, they’ve managed his health care with astonishing results and encouraged him to become a contributing citizen in his home town. Johnnie has the Greenlaw penchant to write (our maternal ancestors), and for many years he has written articles ranging from human interest stories to reports of Town Council meetings for The Era Leader, his hometown newspaper. He also managed the former family-owned business, Johnnie’s Sport Shop, and pursued his early interest in baseball by sponsoring a youth league baseball team, a softball team, a boys’ all-star team and a girls’ all-star team. Johnnie became a regular at the baseball park where he cheered and supported the teams that he sponsored instead of lamenting about his own inability to play. From the photograph of Johnnie, readers can see that he’s an avid LSU Tiger fan and often attends ballgames in a specially-equipped van driven by his father. 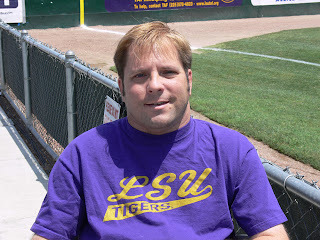 Once, when we were exchanging editorial comments about a story, Johnnie had to stop our email exchange in midstream to watch an LSU football game – the writing of his story was important, but his interest in athletics is always paramount. The natural consequence of Johnnie’s work in the field of recreation was his interest in a 115-acre recreation complex that will provide a facility for young people and adults in Washington Parish, Louisiana. Johnnie became chairman of the Recreation District 1 board, and as Citizen of the Year, he was honored for helping to develop public awareness of a recreational complex that has the possibility of being a major economical boost to the town, as well as a major improvement to the athletic facilities for youth and adults, according to Dennie Fowler, Vice-Chairman of Recreation District l. The first phase of construction of the complex should begin at year’s end or in early 2013. Johnnie has written a series of articles lobbying for this development, has spoken in behalf of the facility, and also uses the Internet to promote the project, typing with a pencil strapped to his wrist. During the years since Johnnie’s accident, I’ve visited him in the home of his parents and observed firsthand their tenacity as a family determined to move past an unfortunate sports accident. Johnnie’s brother Mike has also been a member of the supporting family team that encourages Johnnie’s vision to help young people – there’re no whiners here, just a tightly-knit unit of forward-looking people! In addition to Johnnie’s civic activities, he builds websites and spends time with his niece Katelyn and nephew Jon Michael. Regarding his Citizen of the Year honor, Johnnie says “I was shocked…and I’m very humbled to receive it.” I might add that Johnnie often says he’s blessed, and his wide smile underscores his words! Each time we travel to Asheville, North Carolina, where the artistic life abounds, I feel as though I'm on a writer’s pilgrimage because I inevitably end up visiting the homes of deceased writers. 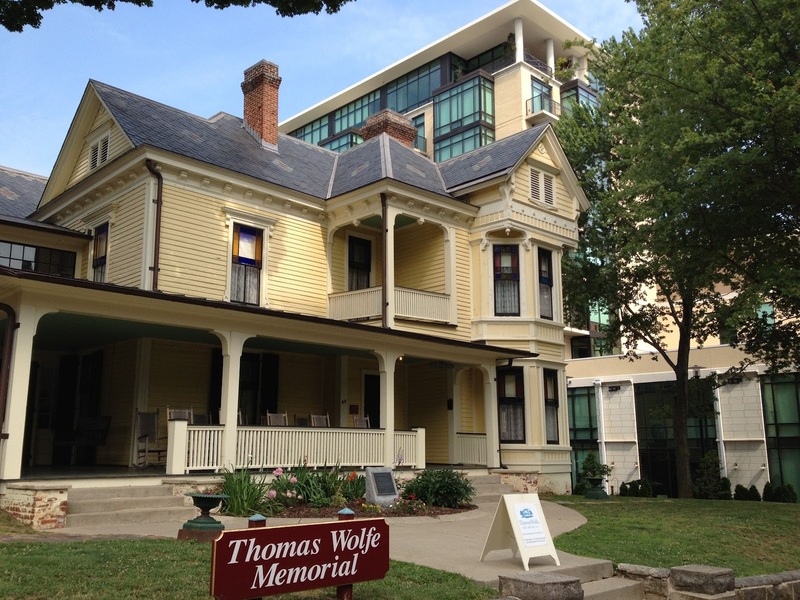 This week, I again stayed at a hotel next door to “The Old Kentucky Home,” the Asheville home in which American author Thomas Wolfe grew up. I toured it for the fourth time! During this tour, I learned more about the 1998 fire that destroyed much of the large yellow frame home that provided the characters and background for Wolfe’s Look Homeward Angel, and I purchased a video that showcased the six-year restoration, which cost $2.4 million dollars. Right now, the home needs a new coat of paint, and I put a small donation in a box reserved for the $35,000 needed to provide several coats of yellow paint. Thomas Wolfe’s mother, Julia Wolfe, cashed in on the real estate boom of the early 1900’s in the “Land of the Sky,” as Asheville was then called and bought the sprawling yellow house, described as “Queen Anne architecture," in 1906. She left W.O. Wolfe, her husband, in his home on nearby Woodfin Street and took her youngest son, Tom, with her to the Old Kentucky Home on Spruce St. Thomas Wolfe disliked living in the home because Julia made it into a boarding house, eventually expanding it to include 18 sleeping rooms, and Wolfe had to move from room to room almost nightly to accommodate strangers who lodged at The Old Kentucky Home. Wolfe later described himself as a “vagabond since I was seven – with two roofs and no home.” He escaped the boarding house and Asheville to attend the University of North Carolina and under the tutelage of Edwin Greenlaw, an English professor at the university (actually my distant cousin), he began writing apace, later developing a passion for playwriting. On the same day as the visit to Wolfe’s boyhood home, we traveled south, arriving in Flat Rock, North Carolina to tour “Connemara,” the farm to which Carl Sandburg moved when he was 67. Carl Sandburg, poet, biographer, author of American folk tales, and collector of folk songs, completed more than one-third of his works while living at Connemara atop Glassy Mountain. He had moved there to find the seclusion necessary for writing, as well as to have ample pastureland for Mrs. Sandburg’s goat herd. At this writer’s retreat, Sandburg spent most of the night writing and slept late, but he ate dinner with his large family and recited from his writings at the dinner table, his youngest children restlessly enduring sonorous recitations for sometimes an hour. Connemara was a large home filled with Sandburg’s library of 14,000 books and old periodicals (he subscribed to over fifty periodicals). The Carl Sandburg Home National Historic Site has the distinction of being the first park to honor a poet. Connemara sits at the top of a 0.3 mile trail and climbs 100 feet – the height of a ten-story building – and I was winded when we finally reached the summit. Goats still inhabit the area and are relatives of Lilian Sandburg’s original herd. They are Toggenburgs, Saanens, and Nubians, and children who visit with their parents are allowed to make friends with them. At one time, Lilian Sandburg’s goats numbered over 200, and helpers milked 50-80 does twice a day. Mrs. Sandburg gained fame for her dairy goats and for her work improving the herd’s bloodlines and production of milk. Her goat milk and cheese were sold throughout North Carolina. I was impressed with the video of an interview between Edward Murrow and Carl Sandburg and came away pondering Sandburg’s answer to the question: “What is the worst word in the English language?” Sandburg promptly replied: “Exclusive.” Sandburg’s answer reflects his life as a lecturer who deplored the exploitation of workers and child labor. He also received honors from the NAACP for coverage of the 1919 Chicago race riots and worked to achieve social justice, and garnered the Pulitzer Prize in History in 1940 and in Poetry in 1951. The last night in Asheville ended on a real “hoop-la,” an event in a downtown Asheville park where hula hoopers, ages three to sixty, danced to T.O.U.C.H. Samadi, an electronic trance dance experience that is popular with those in a program called “Asheville Hoops.” Hoop dancing is touted as a way to exercise and relax emotionally, and the movement to electronic music supposedly transports the hula hoopers to a fourth level of consciousness. The young man in the foreground of Vickie Sullivan's video seemed to be a good example of one who had reached this level. When you travel with a botanist, you never know where you will stop to examine wildflowers. Yesterday, as we returned from shopping in Winchester, Tennessee, my botanist friend, Vickie Sullivan, and I saw patches of beautiful purple thistles alongside the road, and noticing a hill on which the Musk Thistle (or Nodding Thistle) grew, we drove up the road leading to the patch to photograph the droopy purple flowers nodding on their long stems. As the Nodding Thistle loves limestone soils, Tennessee provides fertile ground for these musky smelling flowers. However, they’re regarded as spiky, nuisance flowers that crowd out other vegetation in pastures and also elicit a lot of roadside mowing. 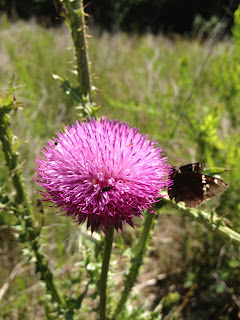 I first encountered thistles during the 70’s while accompanying Vickie on a field trip near St. Martinville, Louisiana where I helped her shroud thistle flower heads with brown paper bags and tied tightly with a string to exclude pollinators so that she could determine if the thistles flowers could self-pollinate. I also returned with her to untie the bags and clip the heads after they had had time to set seeds. No seeds were produced so that she determined they were self-incompatible. But while we were in the field bagging the heads, she showed me that when she touched the top of a gigantic flower head, the spiky, purple flowers began to move. Of course, flowers aren’t supposed to move, and this was an eerie sight! Vickie cut off several heads with her plant clippers and let them fall into a white plastic bag, then returned to her lab to determine if the whole flower or a part of the flower moved. When she examined a flower head under her dissecting microscope she saw that the slender, white filaments deep inside the flower shrank when she touched them with a dissecting needle. At the same time white pollen grains oozed out. At their bases, the filaments are attached inside the purple petal tube. As they contract the petal tube and, finally, the entire flower is pulled in the direction of the contracting filament. The flower moves in a circular path as filaments contract as they are touched by pollinators, and touch one another. In her research, Vickie discovered that the famous botanist, James Small, had noticed this movement many times in other species of the sunflower family of plants while doing research as a graduate student in a Kew Gardens’ greenhouse in London, England during the early 1900’s. However, Small’s observations of this phenomenon weren’t re-examined or even mentioned again in the many hundreds of articles published on the sunflower family following his 1917 publication about the movement of the thistle. Vickie and several colleagues at the University of Louisiana at Lafayette used chemical analyses, electron microscopy, and knowledge of the plants of the family to discover more about the movement in the complex flowers of the plant family to which thistle belongs. They discovered that thistle filaments require a ten-minute period of rest after contraction before they’ll again respond to touch. During that time, the filaments stretch out again to nearly their original length. When a pollinator comes along and touches the filaments while searching and probing for nectar inside the petal tube, the filaments contract, and the hairs of the style scrape the inside of the anther tube, dislodging pollen from the sacs that line the tube. The style emerges from the top end of the tube, its bristles covered with pollen ready to douse a pollinator. This touch sensitive response is called thigmonasticity and operates like a nervous system in animals, with chemical messengers opening and closing channels through cell membranes for movement of water and chemical ions. Water is lost from cells of the filaments when they are touched and re-gained when they re-elongate, a process orchestrated by chemical communication. However, botanists still don’t know what the chemical messengers are. After observing all of this, Vickie and two other colleagues wrote four scientific papers about this subject, published in the American Journal of Botany, Planta, and Protoplasma. The phenomenon of thigmonasticity is an intriguing subject, and it’s an amazing sight when a novice like me first sees thistle flowers responding to touch. Pliny and other medieval figures thought that the milk of the thistle could restore hair to bald heads, so the plant was even used for medicinal purposes, but its greatest claim to fame involves the Scots who adopted the plant as their national flower. There’s an old legend touting that the reason the Scots love the wildflower so much is that in a battle with the Vikings the ancient Scots were saved because a field of spiky thistles drove the Vikings back, and the flower became an ongoing symbol of protection for the Scots. I think that Vickie should be admitted to the Ancient Order of Thistle in Scotland and England and acknowledged as one of the sixteen Knights and Ladies of that order! A "frog strangler and root soaker." This morning I woke up to the sound of rain pattering softly on the roof , a sound that steadily increased to a rapid staccato – a heavy rain that we used to call a regular “frog strangler and root soaker.” When I looked out the window, three deer stared at me from the shelter of trees near the edge of the woods in our backyard, as if they were entreating me to bring them indoors. The shower was welcomed by peonies, lavender, and Dianthus in the small flower beds at the entrance to the back of our home here at Sewanee, but I thought immediately of the relieved corn fields in the valley at Cowan, Tennessee that have been whispering for rain lately. We haven’t had a serious drought since 2008, the second year of our sojourn in Tennessee, when citizens in the small town of Orme, 40 miles west of Chattanooga, had to truck water in three times a week. 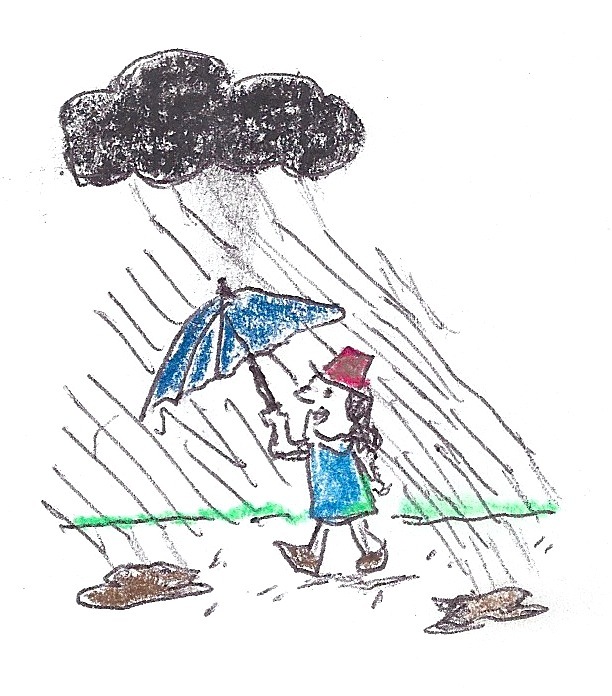 In my childhood, rainy days inspired art in our family home. My mother, an artist, brought out boxes of crayons, coloring books, art pads, and, at times, pastels and would sit on the floor or at the oak dining table with us, coloring away for hours during summer downpours in Baton Rouge, Louisiana. It was also reading time, and until I was seven years old, I thought Robert Louis Stevenson’s A Child’s Garden of Verse was a book written solely for rainy, summer days. Remember “The Rain is raining all around/it falls on field and tree; / it rains on the umbrellas here/and on the ships at sea?” This was a bit of unsophisticated verse, but the illustrations in the several versions of Stevenson’s book of poetry my family owned, gave us a feeling of coziness and safety that lingers with me on rainy days. “The drought continues here, as does our efforts to maintain extra water at “The Castle” (Gary’s cabin on the Plateau). Yesterday, neighbor Bob came up well before 7 a.m., and we went to see the eaglets (they’re almost ready to fledge, weeks ahead of normal). When we returned, he and I went to the valley for 900 gallons of water. We use his heavy duty pick-up and a flatbed trailer to haul a 1200-gallon tank, which took a bit of effort to get on the trailer. Nine hundred gallons x eight pounds is a lot of weight to pull, even for a big pick-up with lots of torque, so that’s all we put in the tank at a time. Tri-County water, which is what most of Montrose, Delta, and Ouray counties drink, is 25 cents for 300 gallons. We put a quarter in a machine and watch. It’s a very fast pump and quite a deal. So mostly, it’s our time and a couple gallons of gas per load of water. I repeat this discussion of water to show those of us who’re enjoying rain and plentiful water that we’re blessed right now. In an earlier message, Gary talked of doing a rain dance with his partner, Susan Elliott, which I understand many Native Americans in dry, southwestern regions of the U.S. still perform in late August. It’s an intricate dance in which the men and women stand in separate lines to make zigzag patterns, rather than the usual circular pattern. .The dance is supposed to bring down rain for the entire year, or at least for the dry season. I don’t know the daily status of New England weather during 1842 when Henry Longfellow wrote his famous “The Rainy Day,” but he seemed to develop melancholia on rainy days and penned some doleful lines about “the day is cold, and dark, and dreary; /It rains, and the wind is never weary…my life is cold, and dark, and dreary; /it rains, and the wind is never weary…” I think Longfellow needed to travel to the West and experience a full-fledged drought to gain an appreciation for this blessing of RAIN! because she has caught the dew of God. of his endurance from a muddy cave. In my leisure time back in the late 50’s, I loved to fish and spend Saturdays floating the Bogue Chitto River with my former husband and his brother-in-law, fly fishing in eddies of the river near the forested swamp around Franklinton, Louisiana. A neophyte at fly fishing, I was fortunate enough to catch many bluegill and sunfish in this wonderful river with its many gravel and sand bars, but my major job, when not fishing, was to watch for logs, which we very often ran over since I was distracted by the other fishermen’s catches. The Bogue Chitto River arises around Brookhaven, Mississippi and flows southward to Louisiana, through Washington Parish and into the west Pearl River Canal at Bogalusa, Louisiana. Our fishing party would launch a green aluminum “joe boat” in the river near Franklinton and fish the waters all the way to the site of the old “Tavern,” which had a landing near Mt. Hermon, Louisiana. At the time of our fishing expeditions, Mt. Hermon, Louisiana, which is still unincorporated, was a small rural community that probably had half its present population of 2,600. Last week, I was surprised to get an e-mail from David Miller, the enterprising owner of Mt. Hermon Web- TV based in this small community where we emerged from our all-day fishing trips. David wanted permission to embed my blogs in his website. I searched online and discovered that the site not only covers news in Washington parish, it includes state and national news, international news, TV picks of westerns, cartoons, documentaries; farm programs, daily crosswords, “Chef’s Kitchen,” and now has three blog contributors. I asked David if he’d tell me more about the establishment of this website based in the hill country of southeast Louisiana near the Bogue Chitto River and to discuss his plans for the site’s future. He agreed to the following interview. Moore: First, I think that readers would like to understand the concept of Web-TV. Would you explain this concept? Miller: Web-TV or Internet TV or Online TV (although distinctions can be made between the terms) is simply the distribution of television content via the Internet. Moore: Did you develop an early interest in communications? And did you major in this subject at a university? Miller: No, I developed an early interest in business thanks to Mrs. Mary Margaret Burris, who taught at Franklinton High School, and I went on to major in Business Administration at Southeastern Louisiana University in Hammond, Louisiana. Moore: What is your main focus or mission for this site? Miller: I started with a mission to provide more information about local government. When the parish government began considering land-use ordinances, I and many others felt we should have been better informed. And then I realized it was my fault – I hadn’t kept up with what was going on. So, my first focus was to video (and make available on my site) the meetings of parish government, town of Franklinton council, city of Bogalusa council, and parish school board. Once started, I added other content: farm programs, military programs, a news page (News Right Now), links, and much more. 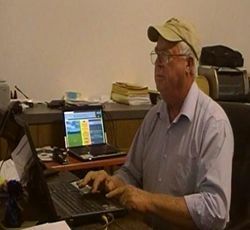 We invite your readers to check us out at www.mthermonwebtv.com and send us comments through the contact page. Moore: Where do you house the equipment for this venture? Miller: The Mt. Hermon Web-TV studio is located in downtown Mt. Hermon in what was Armett Wascom’s Grocery when I was a teenager. However, the building has over the years been a milk distribution facility (in the 1940’s and early 1950’s), a used clothing store, and a beauty shop. Moore: How do you get your ads? Miller: I am terrible at selling ads and need help with this part of the venture. I have made personal contact with some businesses and others have called, wanting to advertise. If someone is running for public office and stops by – he or she doesn’t get away without buying an ad! Moore: Why did you choose to base your operations at Mt. Hermon? Miller: We live only a mile from the studio. Plus, while broadband Internet service is not widely available in rural Washington Parish, the studio is located in an area where high speed Internet service is provided by AT&T. Moore: Were you born at Mt. Hermon and schooled there prior to college? Were your parents interested in the field of communications? Miller: Yes, I am a native of Mt. Hermon and attended Mt. Hermon School until age 13. Our family moved to Franklinton in 1963, and I graduated from FHS in 1968. My parents, Carruth and Junie Miller, had a dairy at Mt. Hermon but after moving to Franklinton, Dad worked for the Town of Franklinton Police Department where he served as Chief for over 20 years. I returned to Mt. Hermon in 1986 and bought the old home place, including the house where I now live and where my Dad was born in 1921. Moore: Is this web site your sole business? And what did you do prior to establishing the site? Miller: Yes, this is my only business. I am devoting most of my time (too much of my time) to Mt. Hermon Web-TV. I retired a few years ago from the State of Louisiana, Probation and Parole Division where I served as Director of the Training Academy. Moore: As a person who obviously has an interest in the growth of Washington Parish, what do you think the parish has to offer retirees and tourists? Miller: I do have an interest in the growth of Washington Parish in many ways. For instance, I want residents to have job opportunities, improved access to broadband Internet service, and the infrastructure to be maintained. But I resist some change. I find that the first thing some people want to do when they move to Washington Parish is change it! You know, it’s pretty good like it is. Retirees will find Washington Parish to be well-governed, friendly, blessed with beautiful natural resources, and to have many leisure activities. Tourists are welcomed. The Cassidy Park Museums in Bogalusa, The Varnado Museum in Franklinton, and the Washington Parish Tourism Commission are great places for tourists to start as they check out Washington Parish. Moore: Do you ever fish the Bogue Chitto waters as I mentioned doing in the introduction to this blog? If not, what are your hobbies? Miller: No, I’m more of a pond fisherman. I did often “tube” down the Bogue Chitto when I was younger. I have a son and granddaughter who kayak and camp overnight on the river. They love it! My most enjoyable pursuit now is being grandpa to Judith, Gabe, Johnny Lynn, and Piper. Moore: Any plans for other communications enterprises? Moore: What do you think of the idea that modern communications and technology are replacing books, concerts, museum visits, and other cultural pursuits that have entertained us in the past? Miller: It would be a shame if we allowed those cultural pursuits to be replaced. The Internet can be used instead to enhance the things we value. For instance, the Cassidy Park Museums (http://www.museumsofcassidypark.com/about.html ) offer numerous programs, such as “My Story” which features the personal stories from people of our own area to give unique perspective and very local flavor to the times in which they lived. However, those who cannot attend (living out of state/country, for instance) can view the video on our Internet TV site, thereby enhancing the program. Similarly, we should not let attending church services be replaced by watching a church service on television. Watching on television (or on the Internet) is a “next best” alternative to attending a concert, museum or church service in person. Moore: Thanks for including my blogs on your site and may your “tribe” increase. Speaking of tribes, tell me about your family. Miller: One of my many blessings is Jo Ann, my wife and partner. Together, we have a blended family of six children and four grandchildren. Thank you very much for allowing me to embed your blog on my site. I enjoy reading it, and I know our readers will also. Last month I spent several days in Chattanooga, Tennessee and accompanied my daughter and her husband on a shopping spree. Mostly, I watched them shop, but when we went into a bookstore, my shopping spirit suddenly came alive. I picked up a copy of David Magee’s MoonPie: Biography of an Out-of-This-World Snack and began reading about one of the snacks that has been consumed by millions of southerners since a recipe was created for the pies in 1929 at the Chattanooga Bakery. My experience with MoonPies dates back to fishing trips in the late 1950’s, which I'll mention in a subsequent blog. MoonPies were an indispensable part of lunch when we floated the Bogue Chitto River fly fishing near Franklinton, Louisiana. We didn’t take along RC Cola, but I’m told that this drink was a popular and inexpensive complement to the pie. During the 50’s the song “Gimmee an RC Cola and a MoonPie” became popular and celebrated the success of this inexpensive workman’s lunch. The MoonPie is a dessert sandwich that consists of two moon-shaped graham cracker cookies, filled with marshmallow and coated in chocolate, banana, or coconut. It isn’t a high fat concoction but the sugar in it is deliciously high. It was first concocted by a chef at Chattanooga Bakery in Chattanooga, Tennessee following the instruction of Earl Mitchell, a salesman for the bakery, who had learned from miners in Kentucky that they wanted a filling snack shaped like the moon for their lunch pails. Mitchell returned to the Chattanooga Bakery with the idea to stack one round graham cookie on top of another, sandwiching marshmallow in between and covering the snack with a layer of chocolate. The concoction sold for a nickel and was a big seller in the coal fields, later becoming popular throughout the South, from the Carolinas to Georgia and Tennessee. David Magee reports that the Chattanooga Bakery doesn’t expend large quantities of its time and resources telling customers how great their product is – the little round dessert pie, about four inches in diameter, sells itself. Of course, there’s the famous MoonPie festival in Bell Buckle, Tennessee, approximately an hour’s drive from Sewanee, attended by more than 20,000 festival goers. It features a run, a parade, and the crowning of a MoonPie king and queen. I’ve always been a week late for the Bell Buckle celebration, but when I want to ship this dessert to my daughters, I shop in Bell Buckle for the snack. I don’t know whether New Orleanians throw the pies from their parade floats, but Mardi Gras krewes in Mobile, Alabama have been known to throw MoonPies, in addition to the traditional beads, to clamoring crowds. According to David Magee, 100 million MoonPies are produced annually, and the Chattanooga Bakery is believed to be one of the largest producers of marshmallow in the world. The MoonPie has a phenomenal shelf life of four months. In the introduction to MoonPie: Biography of an Out-of-This-World Snack, David Magee quotes from one MoonPie consumer in Clayton, North Carolina who claims that the first breakfast she ever fixed for her husband was a MoonPie and an RC Cola, and his book is filled with similar anecdotes extolling the flavor of this snack. When Magee questioned Sam Campbell IV, third generation leader of the MoonPie company, concerning the number of MoonPies that have been produced in its history of over eighty years, he estimated that three to four billion of the flavorful snack have been produced since the first pie was baked! 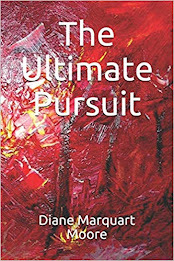 Author David Magee is a newspaper columnist and non-fiction author who lives on Lookout Mountain, Tennessee. He has also authored The John Deere Way and Turnaround: How Carlos Ghosn Rescued Nissan.